Holiday.gr - Igoumenitsa, a trip to a myth! Igoumenitsa is the capital of Thesprotia prefecture. It is a beautiful, coastal town, which connects Epirotic Greece with Europe. The port of Igoumenitsa connects it with the Ionian Islands, Corfu, Paxoi, as and with the neighboring Italy and the ports of Bari, Prindezi, Venice and Angona. This enchanting epirotic town is 480 km from Athens and 470 km from Thessaloniki. It has vehicular connection with all Greece. Igoumenitsa is characterized a “passage”, as it is a way station to Corfu or Italy. It attracts thousands of visitors all year round, but most of them stay here only for a while, without having the chance or the time to discover the hidden beauties. Igoumenitsa is a town of 10.000 inhabitants, and the administrative center of the prefecture. It has remarkable tourist infrastructures and natural beauties. Visitors are enchanted by the alterations of sceneries. The combination of green with the Aegean blue create unique pictures. But apart from natural beauties Igoumenitsa has imposing historic monuments worth to be visited. Take a walk around the spinney and you will be fascinated by the remains of the Venetian Castle ruined by Morozini in 1685. It is said that Morozini took 12 cannons and ordnance to the Castle of Corfu. 134 km from Igoumenitsa, in Lygia, is the Castle of Ragios as and the remains of the ancient town Toroni. Thesprotia was set free from the Turkish in 1913. Igoumenitsa then was a small village named Grava. 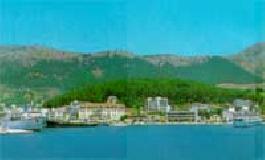 In 1936 was nominated as the capital of Thesprotia prefecture. In 1944 the German soldieries ruined it completely and the town started to rebuilt. A new era was set then and Igoumenitsa started to expand rapidly. Today, this beautiful town of Thesprotia is an excellent choice for short escapes from routine and the ideal starting point for an acquaintance with the magnificent Epirus. Been to Igoumenitsa ? Share your experiences!